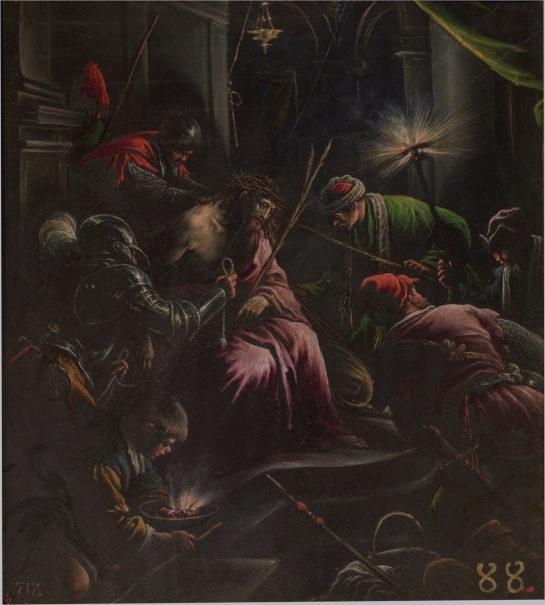 The exhibition brings together a selection of nine paintings on monochrome stone (slate and white marble) by Italian painters such as Sebastiano del Piombo, Titian, Daniele da Volterra and Leandro Bassano, which reflect the consolidation of a new approach to artistic techniques that emerged in the early decades of the 16th century. They are displayed alongside classical Roman works and specimens of natural stone that provide a context for the relationship between painting and natural history, geology and archaeology. 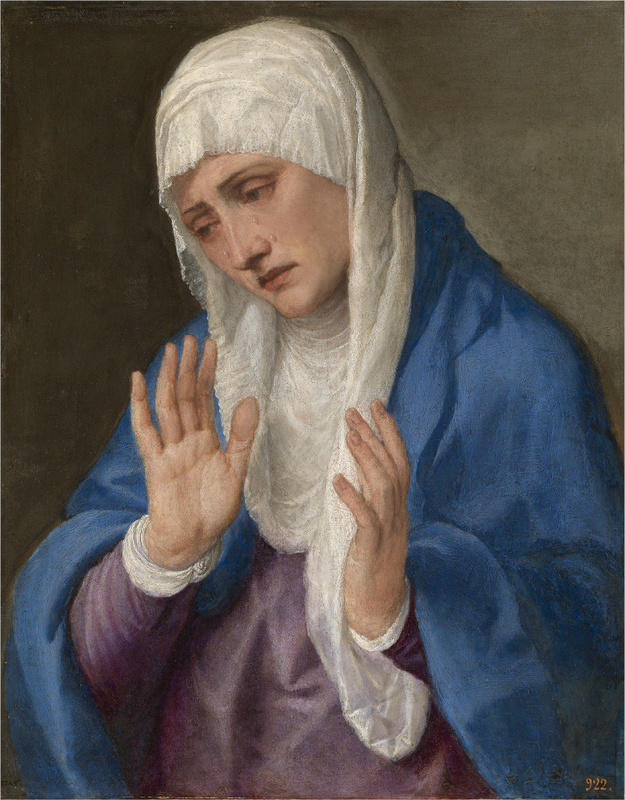 Three of the works from the Prado’s own collection selected for the exhibition have undergone lengthy and complex restoration, funded by Fundación Iberdrola España as Protector Sponsor of the Museum’s Restoration Programme. A carefully selected group of works from the Museum’s collection, together with others from Naples, will reveal the new approach to artistic techniques that emerged in the early decades of the 16th century. These paintings also reflect aesthetic and philosophical concepts of the time: the reproduction of new pictorial effects involving the control of the fall of light on the painting’s surface; the perception of the natural world as codified in classical texts; the paragone with sculpture; and the desire to produce eternal creations. 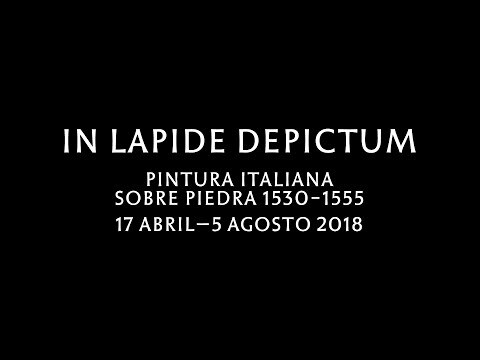 While there have been some previous exhibitions of a general nature on this subject, the Museo del Prado has set out to offer an in-depth focus. 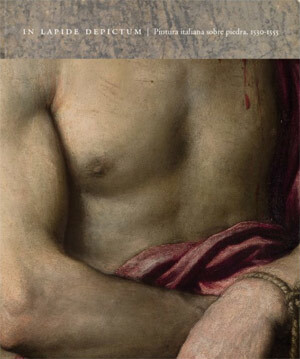 This has firstly involved a study of the theories that stimulated its emergence, and secondly, an exploration of the origins of the technique, its relationship with the classical world and the pictorial procedures that were perfected by Sebastiano del Piombo, Titian and Daniele da Volterra in order to achieve different chromatic effects while making use of unconventional supports and creating works that have survived to the present day. The nature of the support and the close relationship established by the present research project with the classical tradition of polychrome stone has encouraged a collaboration with other disciplines, including natural history, geography and archaeology. This has allowed for a focus on how these works were made and a greater knowledge of them, reflected in different aspects of the exhibition. 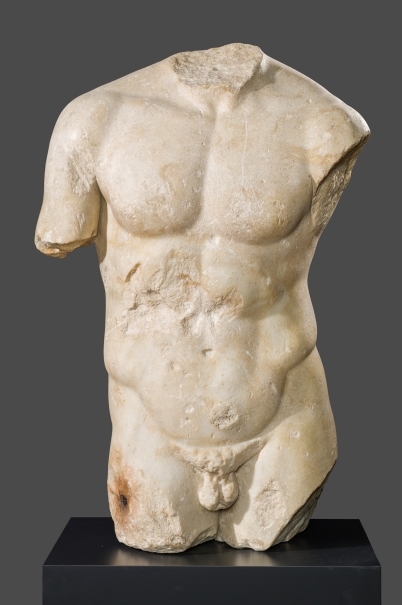 Firstly, through the inclusion of works from these different fields: classical Roman pieces and specimens of unworked stone, which help to provide a context for the selected paintings. Secondly, through a series of very specific studies undertaken using procedures employed in these different disciplines, the results of which are presented in the exhibition’s accompanying publication. The two works by Titian and the painting by the studio of the Bassanos in the Prado’s collection have undergone lengthy and complex restoration in which, thanks to the sponsorship of Fundación Iberdrola España, a number of specialists in different areas of restoration (paint, frames and supports) have taken part with the aim that visitors can fully appreciate the uniqueness of these works, executed in oil on supports both special and rarely encountered in the history of art. Introduction to "In lapide depictum"
In the 16th century, Venice witnessed a new approach to techniques and artistic materials inspired by the rediscovery of the classical world, the arrival of materials from the Near East and the publication by local printing presses of Greco-Roman texts which described the art of the past. Desirous of creating eternal works, local artists were stimulated by the stability of stone to employ it as a support for painting. Stone also allowed them to demonstrate their mastery (using a method that was considered secret) and to create striking effects, controlling the reflection of the light on the surface. It also became the subject of two heated debates: mimesis – the relation between art and nature – and the paragone – the competition between painting and sculpture. The Museo del Prado houses a small but outstanding collection of Italian Renaissance works on slate and white marble created in this context. They have now been analysed with the participation of geologists and archaeologists in order to understand how these minerals and oil paint interacted in these unique creations. Marble and lapis specularis (gypsum) were highly appreciated materials in the classical world due to their ability to absorb and reflect light. 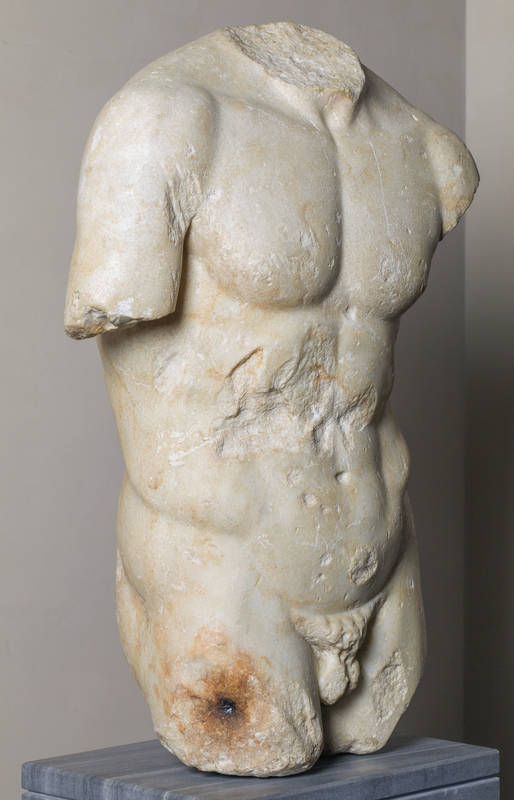 White marble, which is both resistant and absorbs pigments well, was associated with the gods’ skin. In his Natural History (1st century AD), Pliny the Elder observed that there are no sharp lines in nature and that the scenes depicted in works of art should imitate the vision of a slightly evanescent world, as if seen through a “lapis specularis”. He associated stone with the effect of the celebrated atramentum, the varnish employed by Apelles - a Greek painter of the 4th century BC against whom Titian constantly measured himself – to soften the colours in his works. The potential for painting on stone was known in the 16th century as the techniques of the Greek artists passed down via medieval workshops. Theseus and the Centaur, discovered in Herculaneum in the 18th century, is one of the few surviving examples of classical painting on marble. It is not certain that Venetian artists knew works of this type but they are described in Pliny and Vitruvius’s texts, which were translated and disseminated in Venice as early as the 15th century. 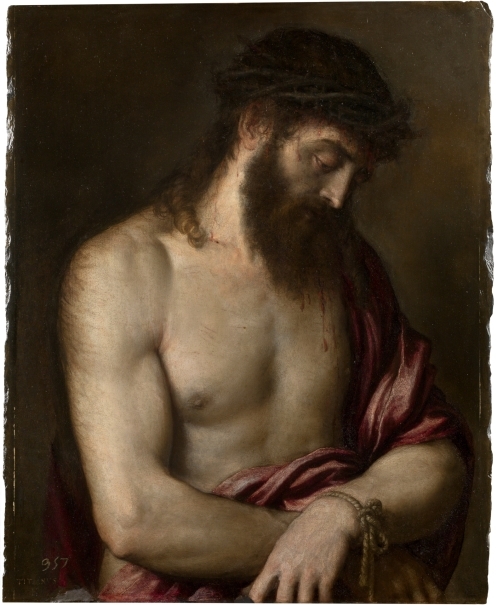 Titian was inspired by classical sculpture throughout his career. The artist lived in Venice surrounded by classical marbles and was familiar with the best collections of ancient art of the day. His Ecce Homo revived the traditional image of Byzantine icons through its recreation of the anatomical appearance of the classical gods and athletes, as well as the worn surfaces of classical sculptures. He achieved the latter by making the slate part of the visible image. 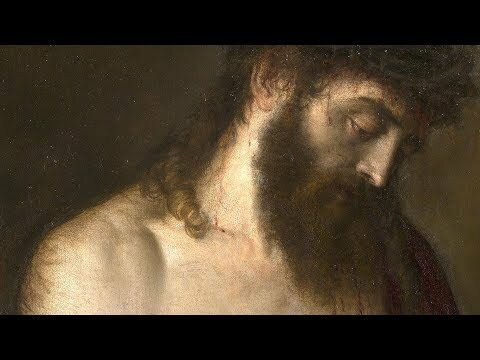 The Ecce Homo reflects some of the Greco-Roman theories on colour: the limited palette, the atramentum, the venustas and the way the tones are modified when applied to a dark base. Titian gave the Ecce Homo to Charles V, while the Mater Dolorosa was the Emperor’s last work the Emperor commissioned from him. 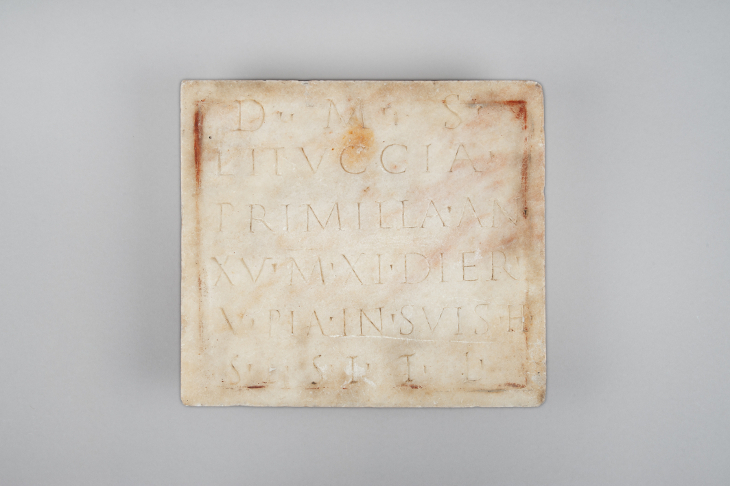 For its support Titian selected an archaeological fragment of imperial marble. The marble grain on the reverse is inspired by the colours of porphyry and Roman murals. These two works allowed Titian to experiment with supports that he had not previously used, to measure himself against ancient marbles and to respond to the devotional preferences of the Emperor, who kept them with him until his death. Giorgio Vasari associated the origins of painting on stone with Sebastiano del Piombo. While the artist did not in fact invent the technique he undoubtedly promoted it and was the first to obtain successful results from 1530 onwards. His Venetian origins and his rivalry with Raphael in Rome were crucial for his experiments with this new procedure. 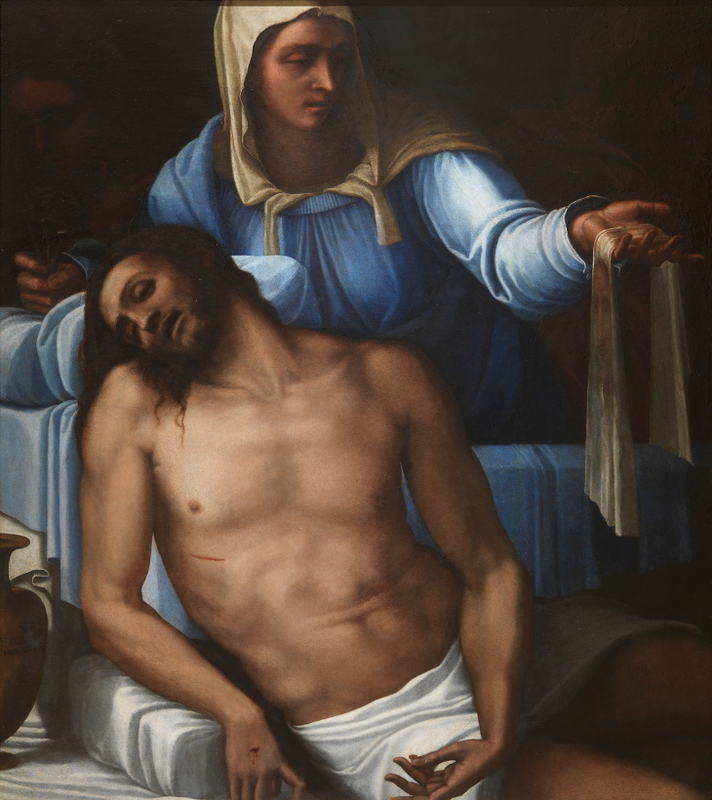 Sebastiano took seven years to paint the Pietà, making use of drawings by his friend Michelangelo. His concerns regarding the transport of this fragile work to Spain are reflected in correspondence from his client, Ferrante Gonzaga, in which the latter asked that it be: “accompanied by someone who understands that things can go wrong and that the Friar [Sebastiano] will be desperate if it’s sent unaccompanied.” Four hundred years after its arrival, the panel was broken during the Spanish Civil War. 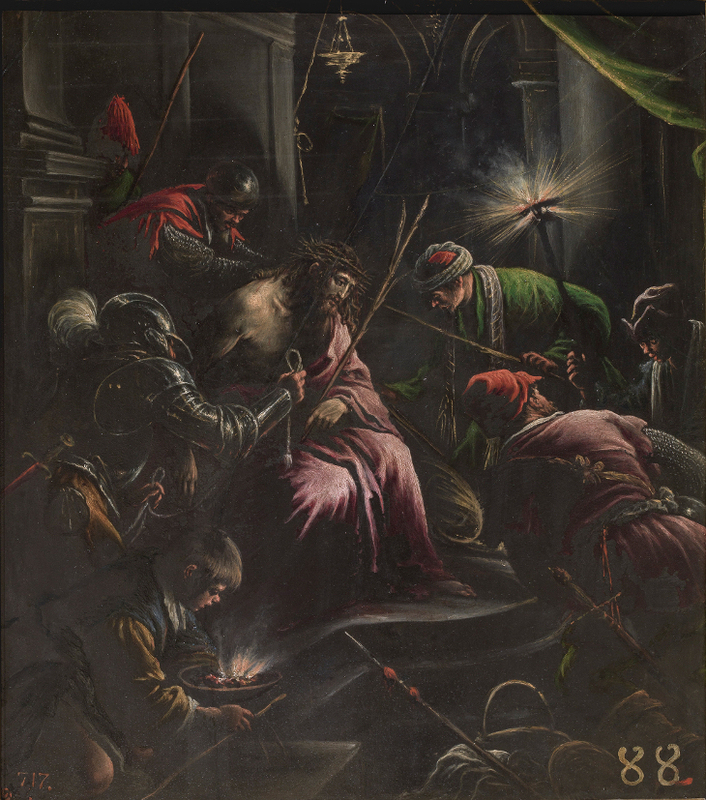 Christ bearing the Cross is an example of Sebastiano’s experiments with dark backgrounds and with the striated mineral’s surface to create the illusion of bodies embedded in the rock. At the same time, he avoided bright reflections on the painting caused by the lighting, another of his obsessions. In many classical texts, rocks are not considered inert objects. For Greek mythology, they were the origins of mankind while the Bible associated them with sacred images. Trilobites, which were highly esteemed in the past, and the graptolites contained in exposed rocks are marine fossils approximately 400 million years old. Marble was the stone most favoured in the classical world for polychrome painting due to its shine, resistance and high colour absorption. However, in the Renaissance it was the more easily sourced slate that became the habitual stone support for paintings. When light falls on it, the greyish tone of its chalky surface and the tiny slivers of mica in its structure produce a glowing effect that harmonises the painted image, creating the illusion that the figures and other elements are emerging from its interior. These properties allow for a wider chromatic range using fewer pigments. 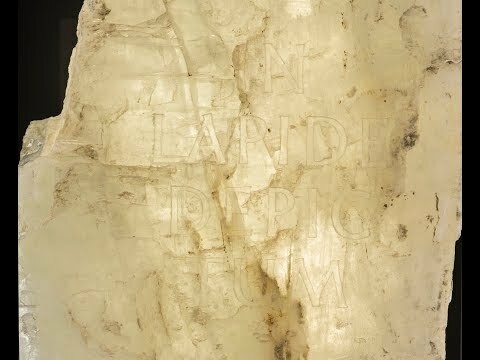 The technique developed by Sebastiano for painting on stone was considered “secret”. Analyses and the reproduction of this procedure in the laboratory have revealed that the key consisted in applying a mixture of hot oil, resins and melted wax to the support which ensured that the oil paint adhered to it. 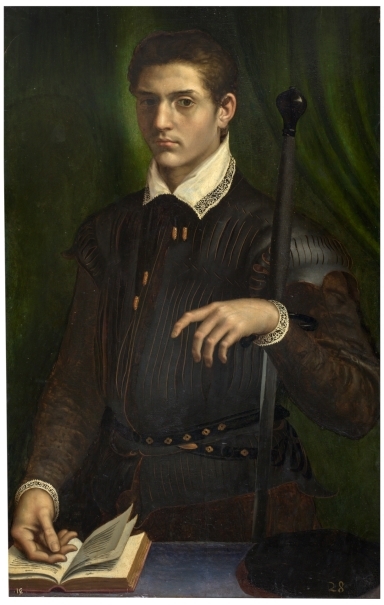 Only the two portraits of the same young man (both in the exhibition) are known by Daniele da Volterra, the Roman heir to Sebastiano’s “secrets”. He painted them at the same time and using an identical technique, despite the different supports. In order to make the paint shimmer and imitate human skin, in both cases Volterra applied the preparation with the palm of his hand. On the slate support he also accentuated the stony appearance of the sitter’s skin by leaving the texture of the slate visible. In the late 16th century and with the rise of the Counter-Reformation, painting on stone supports acquired a devotional and decorative nature which differed from the earlier artists’ paintings. The works by the Bassanos were accessible, aesthetically appealing and conformed to the Council of Trent’s edict on images, emphasising the simplicity of the scenes. The Crowning with Thorns and The Burial of Christ anticipate the separation of figure and background evident in subsequent works on stone: the entire scene takes place in the foreground and the figures seem like cut-out images adhered to the support. They are also examples of the serial production of smaller versions of large compositions by Jacopo Bassano, the head of the studio. Both have losses to the paint surface due to the use of an incorrect preparation and excessive polishing of the stone. The appearance of Titian’s two paintings on stone for the Emperor Charles V was notably distorted due to the large amount of surface dirt and accumulated oxidised varnishes. Both restored by Elisa Mora, the Ecce Homo has now recovered its concealed nuances and reveals how Titian made use of the dark slate base and employed glazes to achieve the effect of the flesh tones and volumes of Christ’s body and the textures of the material of his mantle. 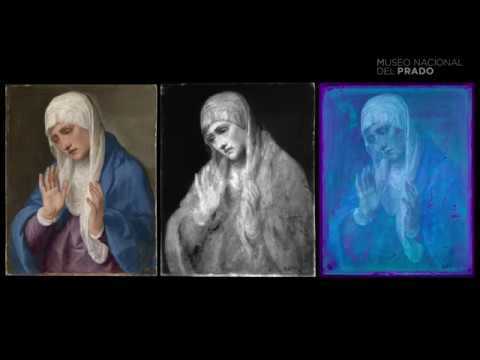 In the case of the Mater dolorosa with her Hands apart, its recent restoration has revealed transparent effects, tonalities and nuances of colour in a painting executed without a layer of preparation, which achieves its luminosity through the white marble, which was sealed with hot oil. In The Burial of Christ by the studio of the Bassanos, restored by Alicia Peral, the volume of each of the figures has been reinstated as well as their exact position in the composition and the depth of the landscape. Furthermore, the restoration has revealed gold brushstrokes which the artist used to achieve the effect of vibration in the lighting, contrasting with the deep, dark surface of the slate support. These restorations have been undertaken within the Museo del Prado’s Restoration Programme sponsored by Fundación Iberdrola España. The accompanying catalogue includes an essay by Ana González Mozo which offers an in-depth analysis of the origins of the use of rocks and minerals in painting and of the theoretical and artistic reasons why they began to be used as supports for painting, focusing on the period when artists employed monochrome stones, between 1530 and 1555. The catalogue also includes texts by some of the specialists involved in the research project.